This project has been a long time in the making. It was actually meant to be an entry for the Sewcialist “Red October” challenge, but then life got busy and I got distracted making Kapibarasan, and it fell to the wayside. Luckily, though, I just scraped it in for Grunge November! Plaid is grunge, yes? Yes. This dress is the ever-popular Elisalex dress by the girls at By Hand London. I’d heard so many good things about it, particularly the bodice, so I finally decided to give it a try. After carefully consulting the advice given in their sewalong, I cut out a size 14, which matched my waist measurement, and did a 2″ FBA so it would fit my bust. I also did a 1/2″ narrow shoulder adjustment, which is becoming the norm for me these days. It worked beautifully, I must say – I’m delighted with the fit of the bodice! If everything had continued as smoothly for the rest of the dress, then I probably would have had this dress done ages ago. Unfortunately, though, the Elisalex dress is drafted for individuals with tiny, slender arms, which I do not possess. Thus, I ended up having to do some pretty severe sleeve adjustments, which was an extremely frustrating and head-scratching experience. 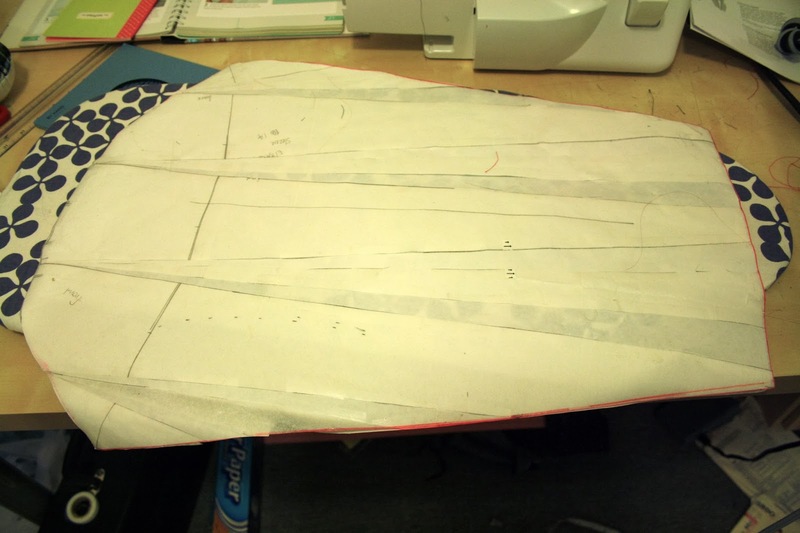 This is how my poor sleeve pattern piece looked by the time I was done. None of the original traced pattern remains (which was done in Swedish tracing paper) – I had to switch to freezer paper halfway through! I quickly discovered there were not many helpful articles online about sleeve adjustments, and despite owning three very good sewing textbooks, none of them yielded anything terribly useful. In the end, the best resource I found was this article by Threads, which I ended up using. I honestly forget how many inches I needed to adjust the sleeve head by – I have a slightly unusual problem in that my biceps are very large, but my armpit area is not, and so I had to try and find a balance between not having huge folds of fabric hanging around my armpit, and not having a skintight upper sleeve. And then, of course, I had to adjust the sleeve length, because I’m 5’1″ and don’t have Amazonian arms – I think I took about 4″ off the length? Plus I had to significantly narrow the wrist width, since it got widened a lot more than necessary with all the other adjustments. In the end, I was mostly satisfied with the fit, but I think the wrists and forearms could still be more fitted. 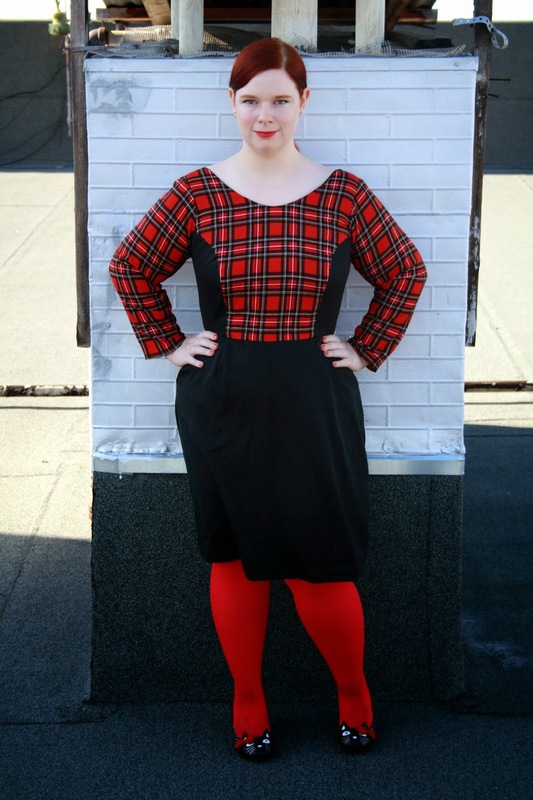 I already knew from the outset I wasn’t going to use the tulip skirt from the original pattern – I mean absolutely no disrespect to the girls of By Hand London, or anyone who has made the dress with that skirt, but I find it’s rarely flattering, and certainly not on me. 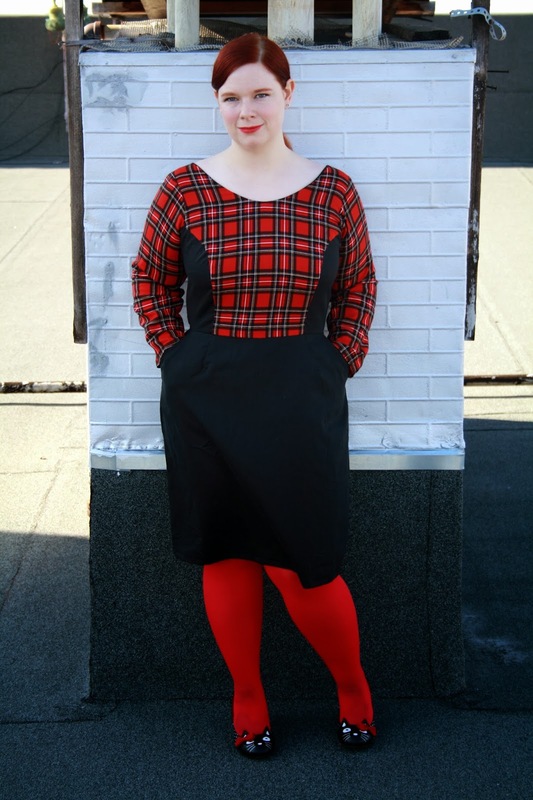 Initially I added the gathered skirt from the Cambie dress in the same plaid fabric as the bodice, but when I tried it on, it looked terrible. It added way too much bulk around my waist, and it was way too much plaid. So I scrapped that, and tried the other skirt from the Cambie, in a black cotton sateen from my stash. Much better! And pockets, too! This was my first time working with plaid, and I found plaid-matching to be a horrible, horrible experience. I got this plaid fabric from the East Bay Depot for Creative Reuse, and so I don’t know what kind of fabric it is. All I can tell you is that it shifted dreadfully every time I tried to cut it, and even when I tried my hardest to match the plaid, it always seemed slightly off. In retrospect, it probably wasn’t heavy enough to work with the Elisalex, but lining it seemed to help a little. I lined the bodice in a black cotton voile from my stash, and I followed the wonderful instructions provided in the booklet for a neat finish. I used an invisible zipper instead of an exposed one – By Hand London recommend a 16″ zipper, but my local fabric store only had 18″ so I simply shortened it by 2″, no worries. I tried so, so hard to match the plaid across the zipper, but in the end I didn’t succeed. It’s not too obvious, and by that time it was my sixth try at inserting the zipper (shifty fabric+late night+stupid mistakes) and I really didn’t care any more. During my many attempts at the zipper, I somehow managed to twist half of the dress around, resulting in some kind of moebius dress nightmare. Do you want to know the worst part? I managed to do that twice. 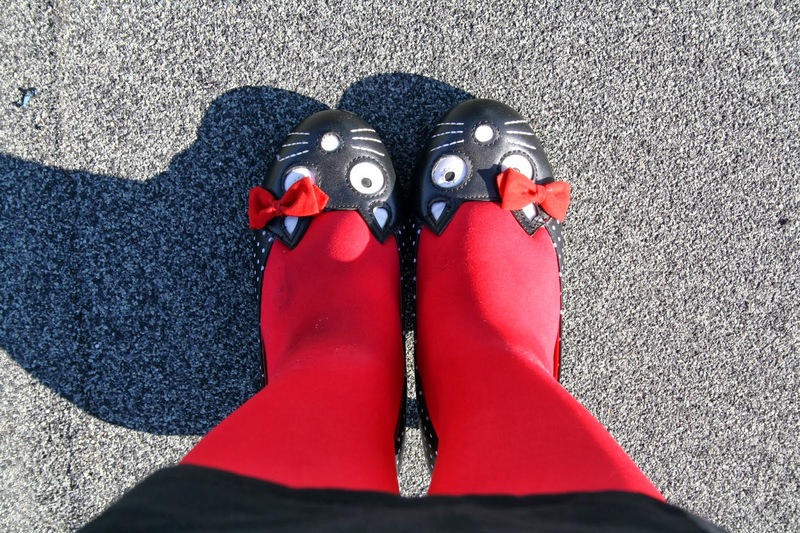 Of course, I paired my dress with my delightful kitty shoes. Any excuse will do to wear these babies! Modifications: Substituted skirt for Cambie dress skirt, view A, size 14. Shortened skirt by 6″. I think this is the perfect holiday dress! Unfortunately, the one holiday party I was invited to got cancelled, so I’ll have to find somewhere else to wear it. Anniversary dinner, perhaps? this dress looks fantastic! It's a shame you had to fight it so much, but hopefully you will get much wear out of it to make it worth while. I love this dress SO MUCH! Now I want the Elisalex dress too. And I need those shoes. Thank you! It's a really good pattern. I too am on a pattern (and fabric!) buying ban now, so I know how you feel! Thanks! They have similar shoes on sale at Modcloth at the moment – still kitties, but houndstooth instead of polka dots. They're so cute!